There's always something we don't like about the things we enjoy. Let's gripe about 'em! It's always fun to vent a little. Here's one of mine: I really dislike Hasbro mixing Equestria Girls in with MLP products. Take the new Cutie Mark Crew toys. It's bad enough I have to go the blind bag route (this is another rant for another day), but why mix EG in? I collect Ponies, I don't want icky little half hume/half pony mutants! I don't like 'em! Make 'em go away! Wahhhh! So, what's your Pony related complaint? Let's hear it! I like ponies with tinsel, I know it can get unmanageable sometimes, but I love how it flashes and sparkles in the sun. I like ponies with 3D symbols. Princess Ponies, Merry-Go-Rounds, Cutie Cascades, Dream Designs, Precious Pockets, Secret Surprise, Magical Scenes, Jewel and Birthstone ponies. Bring em! I like the Sunny Daze and Kimono poses better then the Sweet Berry Pose. I don't like the Collectors Pose at all. Cute girls, but that pose just ruins them. 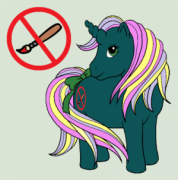 I can't stand jointed ponies. Joints on toy animals ruins the look. I'm not interested in some of the Collector Status Grails like Mimic and Rapunzel. I love neon ponies. I need more neon ponies. Go make some new ones when Gen 5 comes around Hasbro. I can't stand Pinkie Pie, Twilight Sparkle or most of the mane six. I'm so sick and tired of seeing them on the shelves that I'd like to shove them where the sun don't shine! Will be done with mlp if g5 is more of the same. I think the mlp department is run by an evil xerox machine. I don't like equestria girls at all. I think the Drink n Wets are a super adorable set. My Walmart’s haven’t had ANY MLP merch in forever. Like before Christmas. It’s so sad and annoying. I know Hasbro thinks they'll force us into buying the dolls to get the Ponies, but eventually the loose Ponies make their way into the wild, then I grab 'em. I will not to made to buy I doll I don't want. Unless it's in a bag at a thrift store that I happen to buy. They get enough of my money without wanting ALL of it, dang it. And I hear y'all on the low shelves. We just recently got the glitter winged 4.5 Celestia (no Luna) and like Skybreeze, i despise the glitter everywhere). We got wave 3 of the Cutie Mark Crew (so no wave 2 in my area) and a few fashion size 4.5s. I worry they just will stop carrying MLP at all at this rate. And LaW is singing mah tune! NEON PONIES! I wish they were all brighter colours! That's one thing I loveddddddd about G3, so many pretty colours! But I want more, even wilder combos! And deep, saturated bodies, with lush, thick manes of bold hues! I make myself giddy just thinking of them! And speaking of unpopular.... I got 6 new Newborn Cuties. Oh, how their delightful evil smiles entrance me! Except I’m the literal sucker that will end up buying the EQG girl with her pony counter part... because I love Pinkie and Flutters and I can’t say “no” when they’re on sale at Toys R Us (who currently has an MLP sale right now and it’s taking all of me NOT to see what they have in stock). I will admit, I LOVE the new packaging, with the “sketches” of the girls on the boxes. Ugh.. I’m such a design/art sucker it’s gross. Yes on actual Neon ponies again!! I love neon ponies and pastels like the Rainbow Curl ponies. There’s a reason Shady is my all time number 1 pony. I'm the only shmuck who loves the hell out of the Takara ponies and wants them to be revived, even though they didn't sell well when they were released. Everyone deserves a second chance. Oh Nightmare Muffin, I would sooooo love to have a Takara! I think they're adorbs! They have big ol' honkable snoots, I love 'em! I think there is too much pink! I know Hasbro loves to use colors of the rainbow, but would it really hurt to once in a while incorporate black hair? Or have a goldish-brownish pony? I mean, they don't have to make it look like a normal horse, just incorporate some darker colors. I also love the neon colors. With a few exceptions, I prefer my fantasy horses to look colorful and my realistic horses to look realistic. G1 toys and the Stories were Epic and where Hasbro Truly Shined in the Franchise. They were truly creative Especially in the toy line. the G1 toys, are the only real toys of MLP. The rest are nothing more than cheap clones from each other, because Hasbro is far to Lazy to Truly Let the Design artist get creative.. Nothing will Ever Beat the G1 in Unique Creative Genius. because Hasbro isn't a....dang, what was it? Oh! a toy company? How dare they make a new line of toys, right? You do realize She did not overdo the word Darling.. And when she did say it, she did it will Genuine Class. yes that is True at least Rarity did not over do the word either. She was like Heart Throb, saying the word with class. Even she had sense to not over do it. it's Rainbow Dash who over done that word. That annoyed me to hello gravy. And why I avoid the Gen 3 Series..